The tin roof leaked, the verandah posts leaned and the old timber cottage shuddered and groaned when the strong winter winds blew across the bare north paddock We called it "THE RUSTY RANCH" but I suppose it was no worse than hundreds of other, two bed roomed, iron roofed, unlined weather board cottages in country Western Australia in 1942. Sometimes, in the strongest gust, it swayed so much the front door would fly open and scare the daylights out of us. On nights like this we all huddled around the open fire in our pyjamas and made toast with the home made bread then spread it liberally, with frequently used dripping. We called this culinary delight, 'bread n drip,' (butter was expensive, rationed and a seldom seen luxury). For several decades the property, about forty five kilometres South of Perth and five kilometres from Serpentine, had been a dairy farm but was then owned by a wealthy Perth business man who ran it, from a distance, to raise thoroughbred horses and polo ponies. My grandfather lived a short distance away on another of his properties and supervised the 'breaking in' of the young horses and mothered the pregnant mares. I only saw the big boss twice when he came with a party of his friends to shoot rabbits and inspect the most recent crop of new born foals. On these rare occasion, we children were under strict instructions to stay inside, well clear of any stray bullet. Often, Aunty Mavis would read to us from our meagre selection of well-used books, stories we had heard so often that we knew them all by heart. The last adult to bed would always put our heaviest chair behind the door to prevent it from blowing open during the night and if it looked as though rain was likely, anything that could hold water was placed on the floor, at well marked positions, to catch the drips. Not surprisingly, I never felt very secure in that house and endured many restless nights, curled up under an ex-army great-coat, listening to the wind, lying there watching and waiting for the corrugated iron roof to blow away. My earliest clear memories are of the eighteen months I lived there with my mother, younger sister Valerie, my aunt Mavis and her three children, Bernice and the twins, Barry and Errol. At nearly six I was the oldest and the only school aged child, consequently I got blamed for everything, at least that's how it seemed to me. Dad and Uncle Bob worked in Perth, coming home most weekends on my father's ancient belt drive motor cycle. The trip took anything from one to five hours, depending on the reliability of the old side valve B.S.A. and the availability of petrol, it too was rationed. Both families had moved there, from the city, to escape the Japanese who had bombed Darwin in February that year. 'Perth will almost certainly be next. We'll all be safer here,' my mother said, and she should have known. I thought that my mum knew everything because she listened to the huge cabinet radio whenever she could, especially to James Dibble, the A.B.C. news reader. I knew that Japan was a very long way from Australia and wondered why the Japanese could not find Serpentine if they were clever enough to sail half way round the world and find Perth. The old house faced north, 'to take best advantage of the meagre winter sun', Mum said. There were two bedrooms on one side, one for each family, and a combined kitchen/dining room and a lounge room on the other. The bath room, complete with galvanized tin bath and wood-chip water heater, was at one end of the back veranda, although as kids we rarely used it. Instead, once a week, we were bathed in an oval shaped tin bath placed on the kitchen table, one at a time, cleanest in first. I was almost always the last. When the weather was fine I did my correspondence lessons, supervised by Mum, at a rickety old table on the front veranda, or in the kitchen when it wasn't. In the kitchen there was a large Metters wood stove which heated the house, warmed our meals, heated the Mrs Potts flat irons and in the winter became the centre of our small world. There was one electric light globe which hung from the ceiling and another in the lounge. There were no such modem innovations in either of the bedrooms where we made do with a couple of hurricane lamps. Then there was the toilet, a genuine Aussie Dunny. The walls were made of unpainted corrugated iron, as was the curved roof while the wooden door had a star cut artistically into the centre just down from the top. News papers, cut neatly into small squares, hung on two or three large nails, driven into the wooden frame work. The rear wall had a small trap door through which the pan could be removed for the weekly emptying, a task which was dreaded by Dad and Uncle Bob. Sometimes they would toss a coin or play cards or just argue about whose turn it was to empty the foul-smelling four gallon tin. Though this toilet was probably only thirty metres from the house, on a cold, windy night it seemed more like ten times that distance and was a nightmare excursion of frightening shadows and strange noises. So unless accompanied by an adult, I only ventured a few steps down the path before answering the call of nature. The adjoining property, still being operated as a barely profitable dairy farm, was owned and run by an Irish family. There was Ma and Pop, their son Brendan and daughters May and Anne, the prettiest girls in the district, and also the most accomplished ballroom dancers. Brendan had been a soldier since before the war; consequently, he was one of the first to go overseas then one of the first to be sent home. Brendan was recovering from being shell-shocked Today we would probably call it 'post traumatic stress disorder' (PTSD), or some other newly-invented term, but regardless of the name, he was a sad case. Often he was visited by some of his old school friends but I always suspected many of them came to chat with his sisters rather than talk to him. Mostly, he just lay on his bed, staring at the ceiling and despite tobacco being expensive, scarce and strictly rationed; he chain smoked his time away, while his mother refused to believe that anything was wrong with her only son. The entire family were very heavy smokers who always saved their cigarette butts, recycling the precious tobacco for later use. Some times when the monthly tobacco ration ran out and the craving became intense, they would sit in front of the open fire and inhale the smoke. Dad said they even tried to smoke short pieces from a broken cane chair and dried geranium leaves. Three times a week someone would walk across the paddocks to their farm with two tin billies to purchase milk. This was my favourite time because, once a week, I would go with Mum and have her to myself for an hour. We would walk, hand-in-hand and talk. In a house with four other children it was nearly impossible to have any time alone with Mum, so I really treasured the occasions we did the milk run together. I loved the smell of the wet grass, the cows and freshly cut hay. It was also an opportunity to play Ma' gramophone, which was a great honour because I was the only child permitted to do so. I guess being the oldest was not always such a bad thing. The His Master's Voice (HMV)gramophone was her pride and joy. It was taller than me and stood on four beautifully carved wooden legs, in the comer of the lounge room, between the pianola and the open fire place. In the lowest section of the cabinet, behind two hinged doors, there were four vertical storage compartments for the 10 inch, 78 RPM records. Above them there was a wide rectangular opening through which the sound escaped. Most of the records were HMV, but I recall other labels too, like Parlaphone and Decca. Almost all of the recordings were of dance music and names like Victor Sylvester and his Ballroom Orchestra, Guy Lombardo, Glenn Miller and Bing Crosby spring to mind. My absolute favourite was The March of the Bob Cats by Bob Crosby and the Bobcats. I must have played it a thousand times and I would love to have a copy now. I think this beautiful piece of furniture may have been the deluxe model because as well as the superb rosewood cabinet, one full winding of the spring would be sufficient to play three records, though my skinny arms only had the strength to manage sufficient turns on the huge clock-work motor to play two. Almost every Saturday afternoon, Dad and I would take his rifle, a single shot, bolt action, .22 Remington and go rabbit shooting or as he would say, hunting for 'underground mutton'. Our favourite hiding spot was in the hollow of a large burned out tree. It was a perfect place for us to see without being seen, there being several holes through which we could observe three or four extensive rabbit warrens. In those days the four legged fur coats, were in near plague proportions and people talked about places where there were hundreds per acre. Dad must have been a pretty reasonable shot because we almost always returned with three or four, all shot through the head, which we then skinned and cleaned ready for cooking. We had rabbit roasted, baked, barbecued and toasted, in pies, stewed, fricasseed, crumbed and probably several other ways but it was tasty, cheap and nourishing. We all liked it, except Uncle Bob who was a, 'steak and three vegetable man.' According to my father he had as much sense of humour as a house brick and less compassion than an ice berg, who rarely spoke, except to chastise us kids. Many years later while Dad and I were reminiscing over a cold beer on the back veranda he also said of him "the thoughts of his entire life, could all be written down in one paragraph". Note. 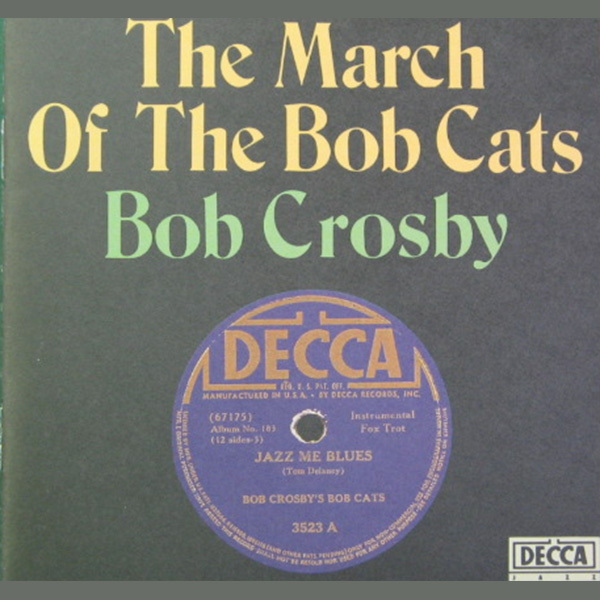 In April 2015 I received a small parcel which contained a Compact Disc the title of which is, "The March of the Bob Cats" by none other than Bob Crosby. It was a surprise present from my son and his partner.